Robots are Coming For Our Jobs,’ yelled the Huffington Post. ‘Robots will destroy our jobs – and we’re not ready for it,’ The Guardian calmly announced. And according to the Daily Mail, ‘Robots taking human jobs is causing a “hellish dystopia”’. So there’s no doubt that automation will affect human jobs. But is it all doom and gloom? And how will this increasing automation affect the HR teams of the future? It sounds a dismal statistic, doesn’t it, 1 in 5 jobs? However, the Centre for Cities paints a surprisingly positive picture, saying that, despite the probability of job losses, there will be an overall increase in jobs by 2030. In particular, jobs that require cognitive and interpersonal skills are set to grow. It’s the use of the word ‘displaced’ that I find most telling. Rather than us all being rendered unemployed by robots, the jobs us humans do will shift, evolve and change. The report points out that Britain’s cities have been coping with automation and globalisation for more than 100 years and almost all of our cities have seen the number of jobs grow during that period. The emergence of new sectors – as a direct result of automation, technology, artificial intelligence, and so on – will lead to new roles that currently don’t exist. Therefore, new jobs, job we can’t even imagine yet, will arise to replace those that are lost to technology. (If you think this is overly optimistic, remember that there were no such things as social media managers or app developers 15 years ago.) ‘Automation and globalisation will boost jobs in British cities over the coming decades,’ Centre for Cities says. 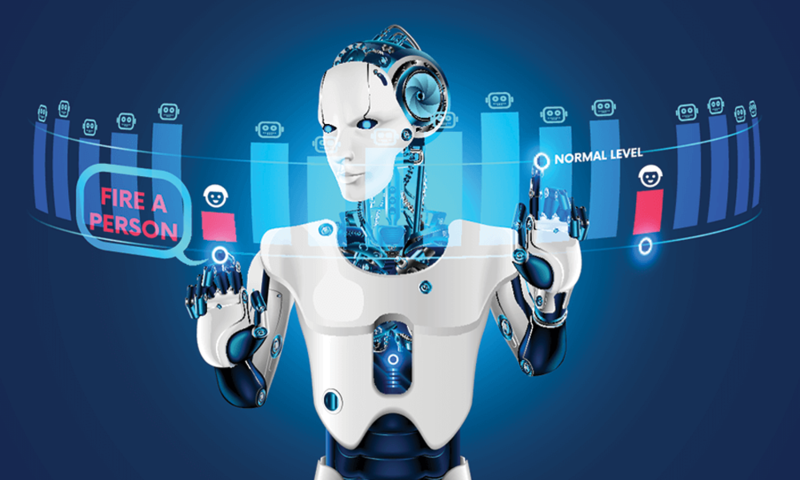 In its annual HR survey, recruitment firm Harvey Nash concluded that AI and automation will have a major impact on HR over the next five years. The survey found that 15% of HR leaders were already affected by AI and automation, while 40% think it will impact them in the next two to five years. Looking further ahead, an Oxford University study concluded that, by 2035, HR administrative jobs had a 90% chance of being automated. Chatbots are becoming increasingly common in our everyday lives. Many large brands are already using chatbots to interact with customers. (eBay’s ShopBot, for example, helps shoppers find and buy eBay items from within Facebook’s Messenger app.) So, as we become more and more used to interacting with chatbots in everyday life, we can expect to see greater use of chatbots in the workplace. Plus, as our workplaces become more geographically dispersed, and the number of remote workers continues to rise, chatbots can fulfil a vital need for employees who don’t have easy access to HR colleagues. AI technology is now so sophisticated that it can respond to natural, spoken language, rather than typed questions, and even detect the underlying sentiment behind the words themselves. Call centres, for example, are using this technology to analyse whether a caller is satisfied, frustrated or angry during the course of their call. Intelligent assistants can also play a role in talent acquisition, from scheduling interviews to supporting (or even making) decisions about applicants. Talla is one example of a chatbot that’s designed to serve as a real-time advisor to HR professionals as they source new hires. Talla can provide a set of interview questions based upon the role being recruited for and even conduct a Net Promoter Score survey following the recruitment process. So, it’s clear that HR will be affected by automation over the next few years. However, just as with the wider jobs market, this should be seen as a positive development. Automating the simpler, administrative-type tasks frees up HR professionals to focus on more important tasks that deliver greater value to the business – tasks that robots and algorithms can’t complete. One critical point from the Centre for Cities report is that greater investment is needed to help workers adapt to the changing nature of work. People and businesses need help preparing for the changes that are coming, and I see HR as being central to fulfilling this need. Read more about how data, AI and automation are transforming HR in my new book Data-Driven HR. It’s packed with real-life examples and practical ways HR teams can deliver maximum value in our increasingly data-driven world.